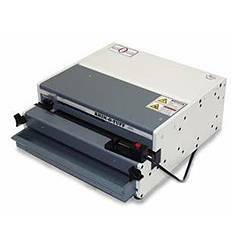 The Rhin-O Tuff OD-4012 is a medium duty paper punching that has a punching capacity of up to 25 sheets of paper at 60 cycles per minute with a smooth, quiet, power on demand operations. The foot petal allows for easy convenient use which is perfect for mid-sized binderies, printers, copy shops, in-plant print shops and large organizations. This machine has an easy “Paper to Pin” sight alignment which is used to make balanced holes on odd-sized applications and features a unique punch registration system which assures accurate margins on an 11” sheet regardless of the die being used. The OD-4212 has the E-Z change die system and comes with both a manual and an auto-reversing feature which prevents paper jams. The Rhin-O-Tuff OD-4012 gives you the opportunity to punch with a variety of different binding methods, like: Wire-O Double Loop Binding, Spiral binding Plastic Coil Binding, Plastic Comb Binding, 3-Hole Punching for binders, and an 11 Hole Hot-Knife VeloBind Strip Binding for maximum versatility. The OD4012 Punch offers the ability to quickly change punching patterns simply by sliding out one die and sliding in a new one without any tools in only seconds! By eliminating the use for tools the possibility of misplacement is very limited and there is no time wasted trying to unscrew and screw a part. The OD 4800 and OD 4000 dies and modules work on the OD 4012, adding additional useful life to existing equipment. Seven different HD style binding modules can be added to the OD-4012 with optional mounting brackets to allow them to be securely attached. These HD binding units can be used as a free standing binding station to create separate punching and binding centers for higher productivity with multiple users. If you have any questions or are interested in purchasing a Rhin-O-Tuff OD-4012 , visit us at SpiralBinding.com. We have great pricing on a full line of Punching Machines. Call us at 1-800-631-3572 for more information!